This week the benefits of being a renter were reinforced. It all started the other night when I noticed a board warping in front of the fridge. Since we're not ones to leave standing water on the floor - especially a wood floor, I started doing a little investigating. Upon pulling the fridge out and finding a large pool of water, I discovered that the ice maker valve was dripping. That 22 year old fitting had become loose, both in the clamp and the valve nut itself, causing what is likely a few hundred bucks worth of damage. The maintenance man came by and discovered more water had also leaked behind the wall and that ants had been attracted to the area. The guys are coming back today to start the planning of replacing some of the flooring. Pretty cool that this problem doesn't involve me having to run to Home Depot, all I had to do was send an email. Now let's just hope that our WI home doesn't give our tenants any problems. Oh, and a public service announcement, go and check your ice maker valves! After five months, Celeste's Noah's Ark wristband finally gave up the ghost. It has been a part of her attire 24-7 since we visited Wisconsin Dells and America's largest water park back in August with Celeste's friends Mary and Quinn. Check virtually any photo of her on da blog where you can see her left wrist - the increasingly tattered plastic band is there, slowly turning from bright green to medium green in color. Noah's Ark is a fun family place - and the only family attraction/amusement park that doesn't completely kill the budget. No $10 parking charges and they'll let you come and go as you please throughout the day. They even have nice, shaded picnic areas in the parking lot to encourage you to b.y.o. No $9 corn dogs! Oh, and here's the wristband I had. Of course mine came off about an hour after leaving the park. A new Joplin R seatpost showed up today. Hmm, what could that be for? You're more than welcome to visit. I think you'll enjoy it better than the Midwest at the moment. Well, would ya look what arrived in the mail on Friday. 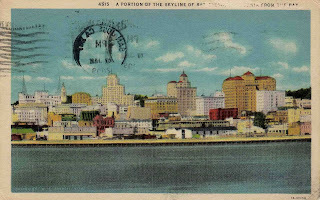 Our very first vintage San Diego postcard. Courtesy of our good friend Don Pal. I not familiar enough with San Diego to know if any of the pictured buildings still stand. Maybe if Don had included a special bonus "we don't deface your postcard" one cent stamp where indicated, the jackasses at the post office wouldn't have placed a barf code sticker across the caption on the front that tore when removed. But hey, at least they canceled the wrong side of the postcard. Sweet rendering of our forthcoming LP! Doodly greetings from Northern California! Thanks Don, that made our day!